memorable in every way. When creating the Bridal Bouquet, it is important to us to go above and beyond and make our Bride’s personal flowers perfect and unique. Picking out the color scheme and types of flowers is where it all begins, but as we’ve learned over the years, it’s the small details that really make an event. Adding ribbon to the stems of the Bridal Bouquet is a popular choice that our clients make because it can give them a totally new aesthetic. Some brides prefer to have the stems of the flowers showing and tied together in the middle with a vibrant burst of color, while others request we cover the stems completely, most often in a color that will match their dress. When clients want to make their stems look a little bit more unique, they often ask us to adorn other materials to the stems, in addition to the ribbon. A beautiful look for weddings with more of a contemporary and trendy theme is adding crystals and rhinestones to the handle to give the bride some extra sparkle. Weddings that have a more traditional or classic theme often opt for pearls or other beading to give their bouquet detail without the flash. 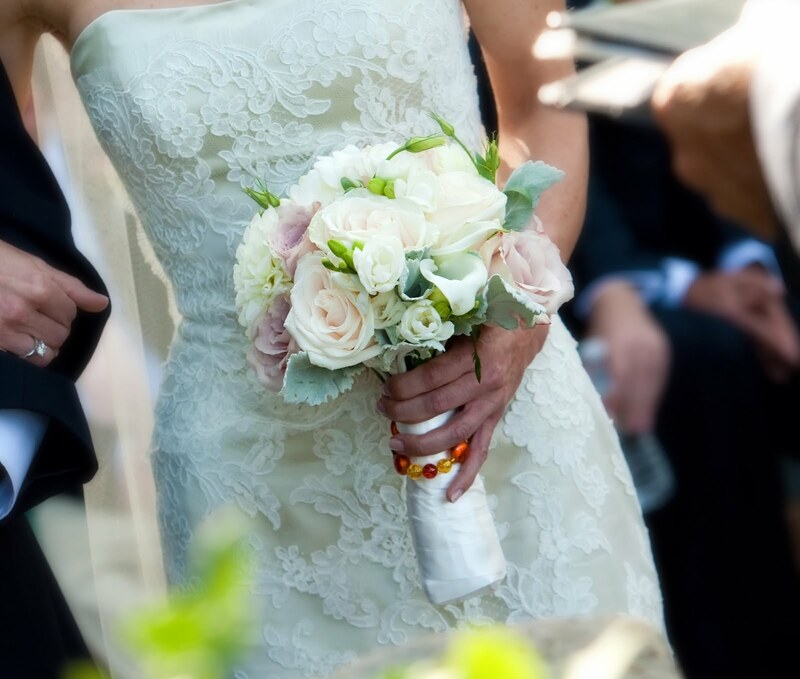 Some of our clients want to use their bouquet handle as a chance to honor someone who could not be with them on their big day. Brides have asked us to incorporate a small photo or keepsake representing them, so they can be there in spirit. 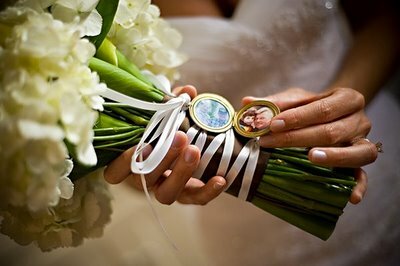 We have attached all kinds of objects including tiny pictures, lockets, and other jewelry to the Bride’s flowers and they always express how special it was for them to have it with them during the ceremony. Some of our past bride’s have even used this opportunity to carry something old, new, borrowed, or blue with them! 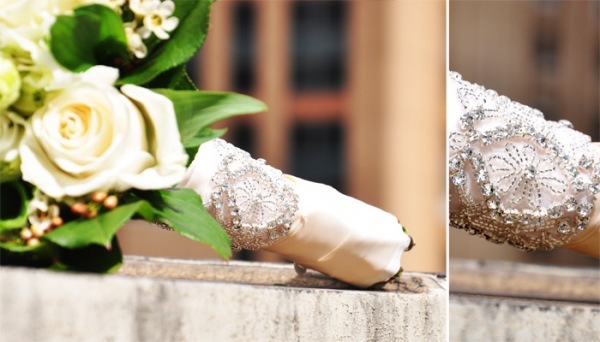 An old piece of their mother’s wedding dress, borrowed pearls, blue embroidered swatches of material, we’ve seen it all, and we to attach to their bouquet handle! The wedding planning process can get a little frustrating, especially if your trying to combine the ideas of yourself, your groom, your mother, your planner, etc. The Bridal Bouquet is one place were the bride’s ideas are most important! 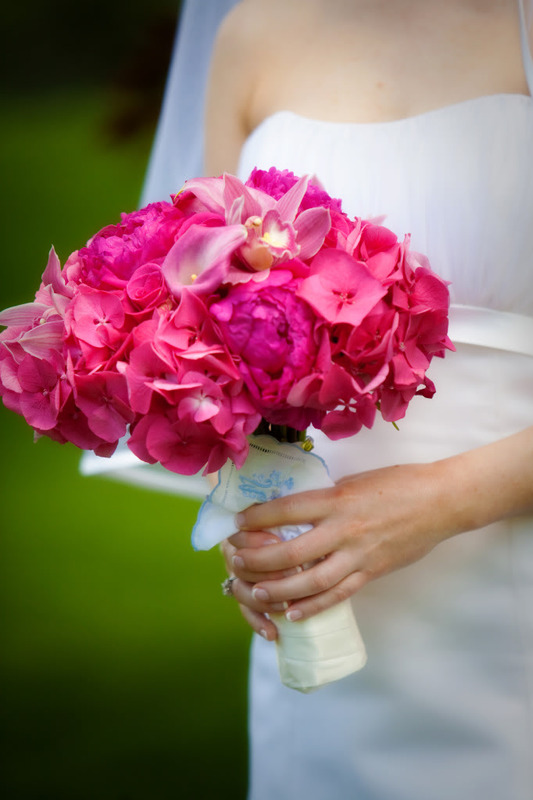 Whether you want to keep it simple, or make a statement, your bridal bouquet is a great way to make sure the details that are important to you make it into your wedding. And although not everyone at your wedding may see the fine detail of your bouquet handle, on that day it is intimate to you and should give you all the emotion you want from it!